How to Remove and Install Heat Exchangers on Bosch C1210? Is your Bosch C1210 water heater leaking and want to fix it? 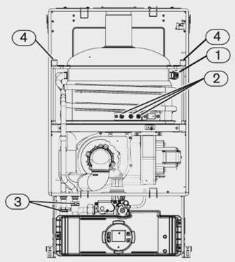 Learn how to remove and install heat exchangers on Bosch tankless and condensing water heaters from C1210 series. This article describes how to remove and install condensing and copper heat exchangers (HE) on C1210 models from Bosch. The main reason for removing the heat exchangers (HE) is when the cleaning is needed due to sooting, sediments or corrosion. Also, the elements would be replaced if leaking has occurred. Keep in mind that condensing HE is the first to be removed and copper after. Tools: Phillips head screwdriver, adjustable wrench, 8mm nut driver with 6 inch extension, a bucket and a towel. Unplug the electrical cord from the wall outlet and turn the gas supply OFF to the heater on the manual shut-off valve. 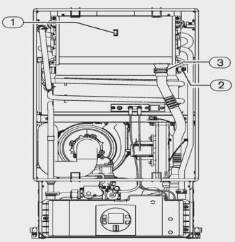 Remove the front panel of the water heater by loosening two screws located at the bottom rear of the unit. Remove the combustion chamber cover by unclipping the upper and lower clips. Turn OFF hot and cold water valves usually installed under the water heater. Open the hot water tap to release the water pressure from the heater. Disconnect inlet and outlet water pipes from the water heater and drain all water from the unit. Use the bucket and towel. Unplug the exhaust temperature sensor (middle of the HE) and overheat sensor wires (on the right side of the heat exchanger) from the condensing HE. Underneath the HE there is a black condensate drain pipe which has a clip on it. Remove the clip and free the drain pipe. On the left of the HE locate the copper pipe that connects both heat exchangers; remove the clips and the pipe after. Do the same thing with the cold water pipe located on the right of the HE. Loosen the two Phillips screws and 4 mm hex head screws from the top left and right of the HE and four 8 mm nuts at the bottom front and top rear to free the condensing heat exchanger. Once the condensing HE is removed proceed to remove the copper heat exchanger. Locate the ignition electrodes and disconnect the wires (yellow and black colored). Remove the clips and unplug the plumbing IN and OUT pipes from the heat exchanger (on left and above the control panel). Expect few liters of water when draining. Use the bucket and towel to collect water drippings. Release the upper two clamps on both sides of the flue gas collectors and take out the clamp shaft of the chassis. This will release the collector. Move the heat exchanger up to separate it from the hot and cold water pipes. The grommet might be attached to the HE lower piping. Follow the above direction but in opposite order, when reinstalling the heat exchanger. It is also recommended to use new gaskets and O-rings. Put the grommets back on the HE lower pipes, upper and lower gaskets too, carefully, to prevent leaking. Ensure proper seating on the burner. Connect the hot and cold water piping from the HE into the pipe connections. Ensure proper alignment. Put the clips back onto pipes. Put the grommets into its holes in heater's chassis. Make sure the clamps and clamp shafts are in place, aligned and firmly attached. Reinstall the condensing heat exchanger using the direction from above but in reverse order; put back the screws, nuts, drain and cold water pipes, clips, sensors. Make sure that all gaskets are properly seated. Reinstall cold and hot water piping and open slowly the water shut off valve to check for leaks. Put the combustion and front covers back. If there are no leaks, plug the electric cord to the electric outlet and open the gas manual shut off valve to resume the power. Detailed guides in pdf, here and here.